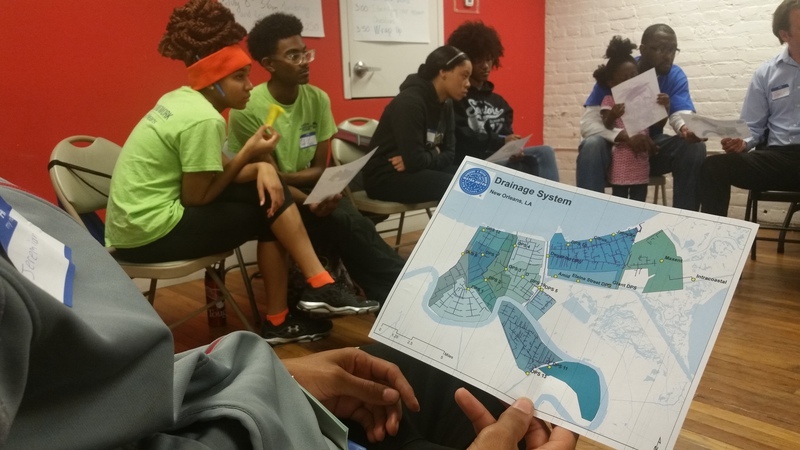 On March 4th, we hosted an event in New Orleans that was the first of the New Orleans Stormwater Workshop Series. About 18 participants gathered for this event at the New Orleans Healing Center. After discussing what we know about stormwater on a personal level, and learning from friends at the New Orleans Sewerage and Water Board about the stormwater system in the city, we attempted two activities, the first was a visual site survey of where we're hoping to run this project, and the second was picking our research question (we used this post to help us with this activity). During our site survey we visited the three spots we're hoping to design a stormwater investigation around. 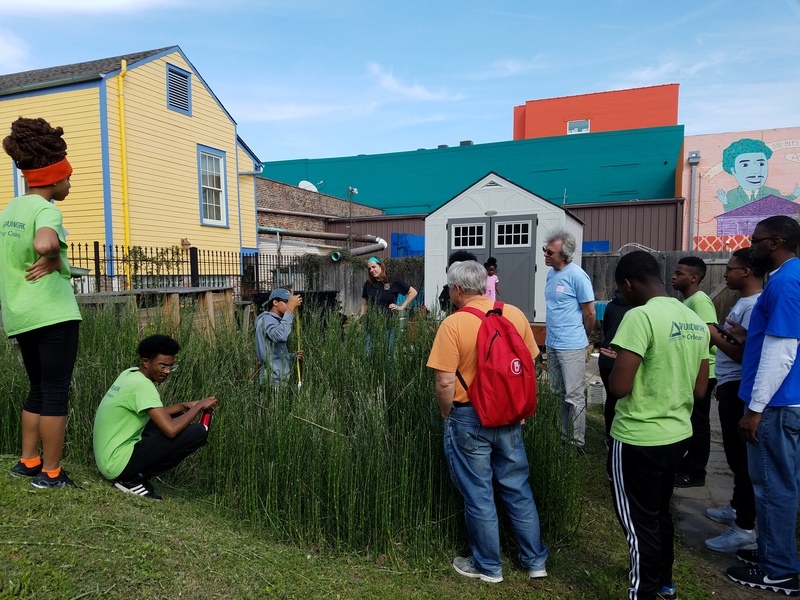 The first location was Groundwork New Orleans' Earth Lab. This site is interesting in terms of stormwater because the rainwater from the large buildings around it is directed into the large bioswale there. The site is mostly grassy with garden plantings. Some of our observations about this site were that, there's a large retention pond there, but that the pond was dry at the time. But we also noted that it had not rained a lot recently. The site is mostly grassy with garden plantings. We observed the landscape outside the bioswale was mounded, and that the swales themselves were full of vegetation. While there are trees around the site, it's mostly clear on the inside of the Earth Lab from overhead obstruction which could be useful for balloon mapping in our next workshop. The second site we're looking at investigating in this series is on the corner of Spain and Rampart. We know the New Orleans Sewerage and Water Board has received complains about stormwater there, especially since it's located right next to a school's playground. Unlike the first site, this area is a paved road corner. We observed that even though we hadn't received rain a lot of rain recently, you could see where leaves and other debris had piled up from where previous stormwater had dried on the road. The site has a large oak tree over it and, perhaps because of this, the road at the site has a sizeable bump to it. We noticed the street has several storm drains on it. 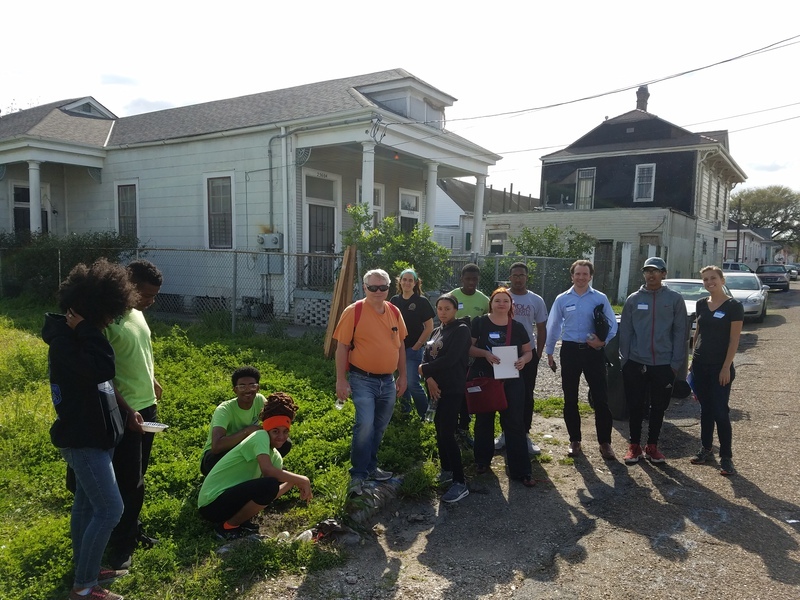 The Villere Street site is the location for a large development project slated to break ground in September. The goal of this project is to deal with the recurring stormwater flooding problems of this street. (You can read more about the project in the link above.) We observed that unlike the previous site where we could see storm drains, we did not see any on this street where we looked. As we walked down the street we could see spots where water had pooled in the past. We could tell this from the presence of moist algae in large mats on the side of the road. The street also had several spots where people had put down rocks and other features to walk over standing water. We noticed that the street at this site is slightly mounded in the middle, and slopes down to the curb on both sides. We also found an exposed pipe (picture below) and were curious if this was part of previous stormwater infrastructure. We did an activity based off of this post to help us pick our research question. Instead of talking about advocacy, we brainstormed the ideas of research questions we had. 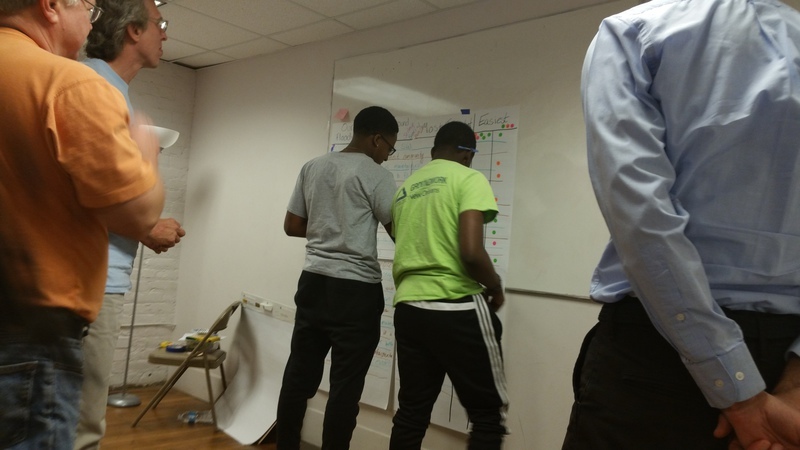 Then we went through them and sorted them by category: Social, Science and Policy. We then focused on the science questions (marked with purple dots in the photo) and identified which ones would be the easiest (on a scale of easy-green, medium-orange, hard-pink on the far right hand column of the photo). Then, we were each given two dots (colors didn't matter in this round). From only the easy questions we identified, we individually were able to chose which questions we felt were most important (assorted colors, marked in the middle column of the photo). We were able to put two dots on one if we were really compelled towards that question, or divide up our dots. The questions with the most dots in this round are the ones we'll move forward with for the rest of this series! How can we tell what contaminants are in the stormwater? 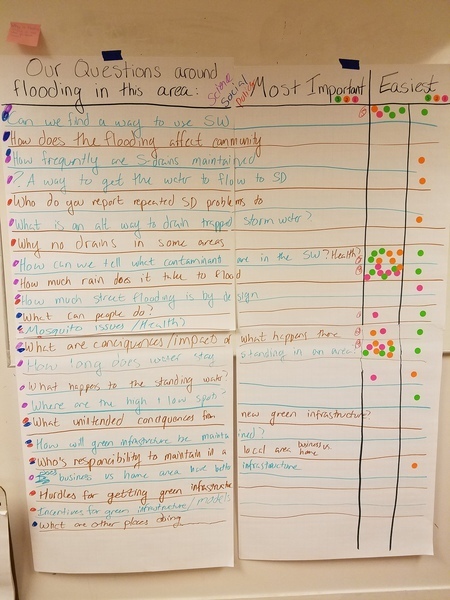 We're looking forward to our next event where we'll map our sites in preparation for designing our stormwater study on these questions! This will be April 18th. Open event, come by and help!